Capabilities lie at the heart of a mature enterprise architecture practice and are mentioned throughout the TOGAF documentation. This poster describes how capabilities are not always given the priority that they need. It explains how there are three types of capability that are closely interrelated - the success of the EA team depends on the right level of maturity for all three of these capability types! 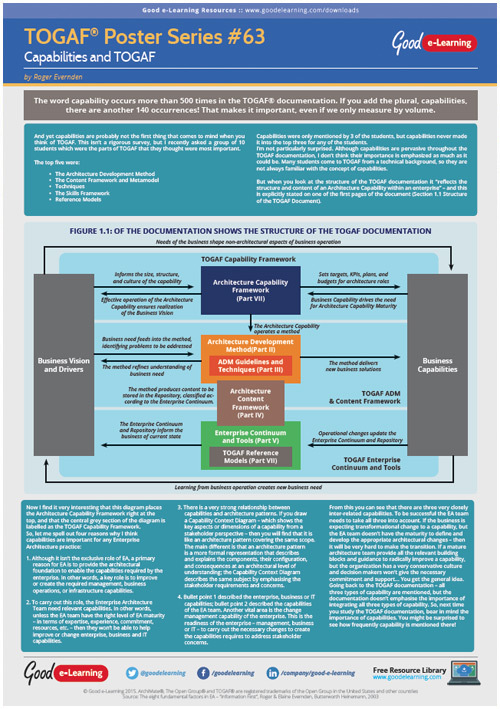 Download this TOGAF poster by our very own Enterprise Architecture expert Roger Evernden and you’ll also gain instant access to our entire library of 450+ Business and IT learning resources!